After many years of campaigning and advocating for greater attention to the global problem of bullying, headway is being made. Last week saw the launch of the UN Report on Protecting Children from Bullying accompanied by a new publication 'Ending the Torment: tackling bullying from the schoolyard to cyberspace' bringing together research and strategies on tackling bullying to which we had the privilege of contributing. Until recently research on bullying came predominately from high-income countries; far less is known about children’s experiences of bullying in low- and middle-income countries. Research with colleagues at Young Lives and UNICEF Office of Research has tried to go beyond what we know already, and to consider how wider societal and structural factors shape the contexts within which bullying occurs. To do this we used data from the Young Lives longitudinal study of childhood poverty in Ethiopia, India, Peru and Viet Nam to address two questions: which children are at greater risk of being bullied, and how, at age 15? ; and why are certain groups of children bullied? A series of questions were asked of children about whether they had experienced different actions (which are categorised into forms of bullying – indirect, verbal, physical and attacks on property). So called ‘indirect bullying’ (such as humiliation acts, or excluding children) is the most commonly reported across three of the countries (see below), physical bullying is actually the least commonly reported across the countries. Name calling and other acts of verbal bullying is also common, and in India and Peru attacks on property are also at similar levels as verbal and indirect bullying. Not only is bullying common across the countries but it is important to extend of awareness beyond physical bullying to encompass the often more hidden forms of emotional and psychological bullying. Boys are significantly more likely than girls to report experiencing physical bullying in Ethiopia, India and Viet Nam. Boys also report experiencing more verbal bullying in Ethiopia and India and in each case girls were half as likely to report verbal bullying as boys. In contrast, girls are more likely to report indirect bullying in India and Peru. 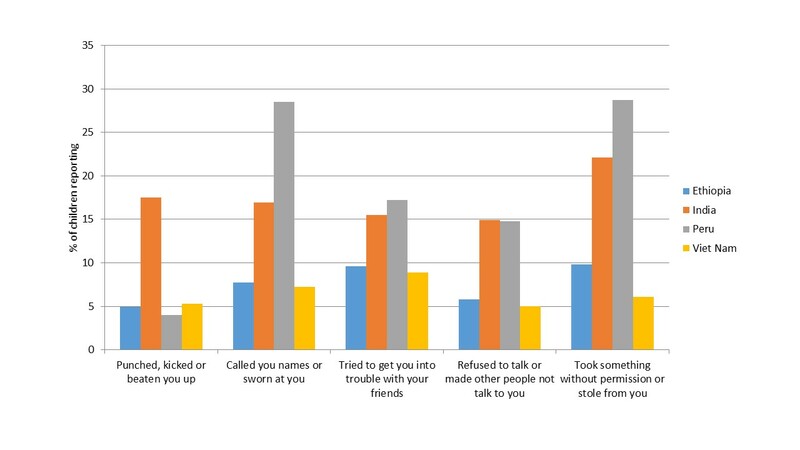 These patterns mirror findings in studies from high-income countries which have found while boys experience more physical and verbal bullying, girls are at greater risk of being bullied indirectly. Earlier we used to be in school [doing homework] but now no one stays back after school... we all decided now in 10th class we return home fast. […] Big boys used to come and sit there, at the school... Because other boys come to the school, so they [the girls] don't come now. In Ethiopia and Andhra Pradesh girls described fear of using the toilets, which are often not gender-segregated and so the girls feel unsafe and concerned about bullying and harassment from boys. Bullying in part then, reflects wider unequal gender norms, with boys also being affected, such as for failing to exhibit so-called masculine behaviour. They [his parents] advise me not to have friends who are out-of-school. They advise me to have children who are learning. They believe that those who are out-of-school can spoil my behaviour. As a result, I stopped relationship with friends who are not learning. Children who did not attend school discussed not being liked by children who were in school, who did not socialize with them or treat them with respect. On occasions, children who did not attend school retaliated by verbally or physically threatening or bullying other children on their way to school. I went to school barefoot because my shoes were torn apart. Then students laughed at me, and some of them insulted me calling me a “poor boy”. Conversely, children remembered the occasion of getting new clothing as one of the happiest events in their life because it gave them dignity, security and protection from insults from their peers. Efforts to tackle bullying have lagged behind those directed at other forms of violence affecting children but are rising up the international policy agenda, as indicated by the 2014 UN General Assembly Resolution on protecting children from bullying. The new UN report takes that agenda forward, in the context of the Sustainable Development Goal focus on reducing forms of violence, abuse and exploitation are important opportunities to stimulate greater international and national attention to violence affecting children more generally, as well as the specific dynamics of bullying, including better data collection and increased resource allocation to violence prevention. Bullying is not inevitable and the new publication from the UN Special Representative on Violence against Children offers important evidence on what can be done from the legal and policy level down to schools and communities to ensure that no child’s life is blighted by violence. Experiences of Peer Bullying among Adolescents & Associated Effects on Young Adult Outcomes: Longitudinal Evidence from Ethiopia, India, Peru and Viet Nam by Kirrily Pells, María José Ogando, and Patricia Espinoza Revollo.